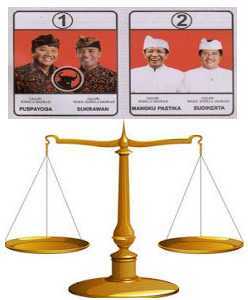 Bali Governor election, 2013, held tight, the sound is very thin difference between the two gubernatorial candidates Bali. From a quick count and accumulation of votes carried by each candidate for governor, they each claim to be the winner. There are three media survey, which did a quick count, the election of the governor of Bali. The three media that give different results. So that both candidates were claiming to be the winner. Mate Made Mangku Pastika-Ketut Sudikerta , who carried the Democratic Party and the Golkar Party, claiming superior in calculations are done manually. They claim to be the winner with 51.68% of votes, while his opponent AA Ngurah Puspayoga-Dewa Sukrawan gain votes 48.32%. But gubernatorial candidate AA Ngurah Puspayoga-Dewa Sukrawan also claims to be a winner, with 50.7% of the vote, while the pair Pastika-Sudikerta only 49.3%. According from manual calculations, mate-Sudikerta Pastika excel in the vote. Meanwhile, the quick results qount conducted by Saiful Mujani Research and Consulting (SMRC) states Puspayoga superior, by gaining 50.31 percent of the vote. Made Mangku Pastika while 49.69 percent of the vote. Different results were also obtained from a quick count carried a local TV station, TV Bali. From a quick count in Bali TV, couple Puspayoga 49.55% gain votes. Whereas couples Pastika gain as many votes as 50.45%. Difference from the results of the vote count fast it makes people confused and restless Bali. Because the results of the difference is not much different, in fact almost balanced, is likely to produce a commotion in Bali. Because each of supporters of the candidates for governor, wants to be a winner.